1 Heat the grill. Arrange the courgettes and fish in a lined grill pan, season generously and drizzle with olive oil. 2 Grill for 5 mins, then turn the courgettes and grill for a further 10 mins, until the veggies and fish are tender. 3 Microwave the sauce for 1 min. 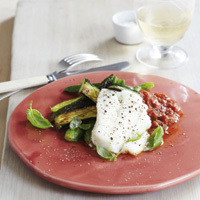 4 Serve the courgettes and fish with the sauce, then scatter with basil leaves. A variety of fish would taste delicious in this dish, so look to see what’s on offer: for example, haddock, pollack and plaice would all work well instead of cod.